You are looking at the MIKE TROUT & Grichuk 2009 TriStar Autograph Rookie Auto Printing Plate 1/1! GET IT NOW WHILE YOU CAN! 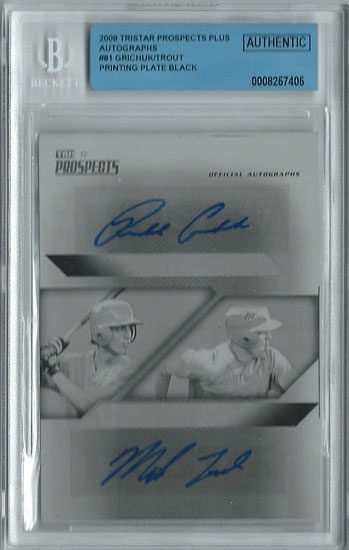 Certified Authenticate and Graded a BECKETT 10 AUTO ! Compare this to some of the bowman chrome sales.....In comparison, we just saw a 2009 Orange Refractor sell for $186,000 in Goldin Auctions March 6 2019 recently.... THIS PUPPY IS THE ACTUAL ONE OF ONE !! 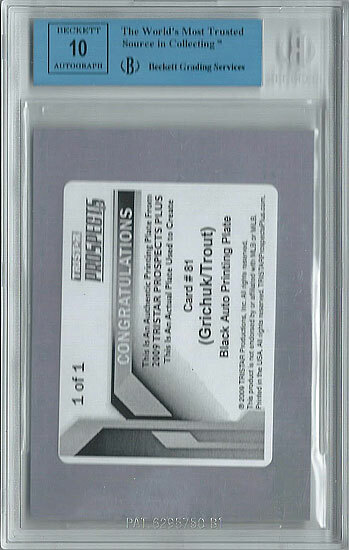 AUTHENTICATED AND ENCASED BY BECKETT GRADED A BGS 10 AUTOGRAPH !! When comparing it to the others, this is a true value piece !! Also, be sure to check out our other items - we have TONS of rookie cards listed - base-cards, variations, autographs, limited edition, shortprint autos, rare 1/1's, and also bulk closeouts - and you can find it all listed in our store right now! Please email with any questions before bidding. Thanks for looking and Good Luck!